Moor Mud is a therapeutic treatment, enjoying a frequent mud bath will achieve overall healing benefits. The fine paste structure allows moor peat to dissolve in the bath water without any danger of clogging the plumbing and is suitable for use in standard bathtubs. To take a Moor Mud Bath, run water to a temperature that is as hot as you are comfortable with. Whilst water is running dissolve one to two packs of 250 ml mud. Due to Moor Mud’s excellent ability to retain temperature (5 x warmer than bath water temperature) your bath water will remain a consistent heat for the recommended length of the bath which is up-to 30 minutes. After bathing, shower in warm water without using soap or shampoo, wrap yourself warm and relax for a further 20 to 30 minutes. This time is used to allow natural moisture treatment to stay active on the skin. How much moor mud to use? To start the treatment series, use one 250 ml pack. As you progress you may want to increase the dose up-to four packs especially if a large bathtub is used or when in significant pain. For a routine light therapeutic effect, detox routine, or post-workout use one 250 ml pack per bath. For pain, gout, sore muscles, colds, strains, flu, use 2 packs per bath. For general use e.g. Detox, skin treatment or relaxation, one 250 ml pack is recommended. Note: If you begin to feel agitated on first application it is highly likely you have toxins within your body, please persevere by re-applying or bathing another 3 to 4 times. Once your body becomes less toxic, your experience will be one that you will appreciate and love. 1. Natural moor mud is therapeutic, healing and relaxing, so try not to be to active afterwards. Count on 30 minutes minimum to one hour of laying down relaxation time. Do not consume food post moor mud treatment for one hour. This is necessary as blood flow increases externally in order to cool the body, thereby taking blood away from the digestive system. One may feel unwell if food is to be consumed straight away. organic essential oils to your moor mud bath. Do not however add non-organic essential oils as these become a “concentrated pesticide bomb.” Also do not use solvent extracted essential oils as these are harmful. It is safe and beneficial to add Dead Sea Salt to the mud bath water. 3. While the bathtub is filling, prepare a place to lay or sit to relax after the bath. Keep in mind that you probably will perspire quite a bit after the bath, so have a suitable cover ready to absorb the sweat. You need to stay warm and comfortable for ½. 4. It is important that you be hydrated as you can perspire immensely. Thus, while your bath continues to run, drink warm water or herbal tea. (green tea adds to the detox) Do not drink caffeine your heart rate will already increase from the moor mud bath. 5. Drink warm water or herbal tea after the bath. Due to the amount of perspiration, one must replace electrolytes. Avoid cold water. It can shock your system. 6. Make sure all moor mud is dissolved. Retrieve the clump of moor mud and squish it until it is all suspended in the bath water. Get into the tub and immerse as much of your body as possible into the water, keep feet submerged. 7. Enjoy the experience! Remain in the moor mud bath for a maximum of 30 minutes or less if you feel you must exit. If you start feeling light headed, get out of the tub immediately! It is often a sign that your detox level has reached an optimal maximum for the session. Be careful getting out of the tub. 8. When finished, shower to remove moor mud particles without soap or shampoo. This way none of the secreted toxins will remain on your skin. 9. Refrain from putting any moisturizer on after your bath. You may feel a little tired from the treatment this is natural, you may also get mild head-aches as you detox. 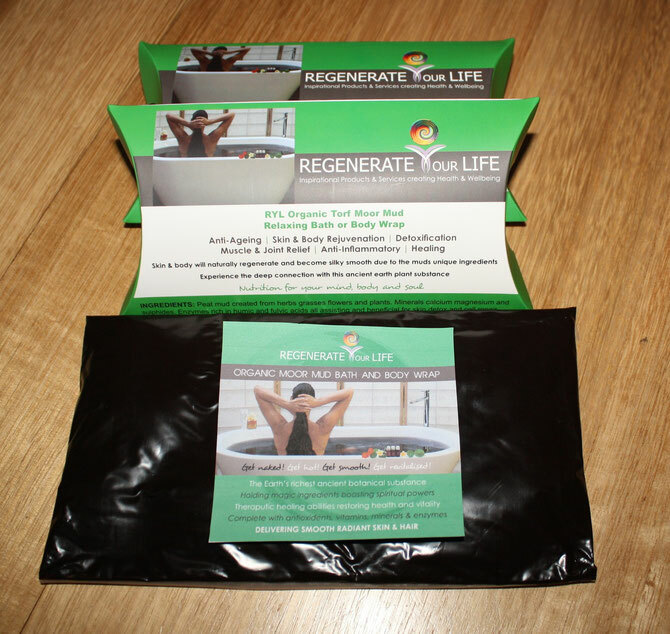 Note: REGENERATE YOUR LIFE Moor Mud is safe for bath and spas. Its organic matter will not clog your bath, spa, or drain. Suitable for Bio-Cycles creating rich organic waste water. Mud will not discolour or damage your bath. To clean bath, use soft cloth and favourite natural cleaning agent. Warning: Persons with High Blood Pressure or heart disorder must first consult a physician. If skin irritation develops or prior irritation increases, discontinue use. Avoid contact with eyes. 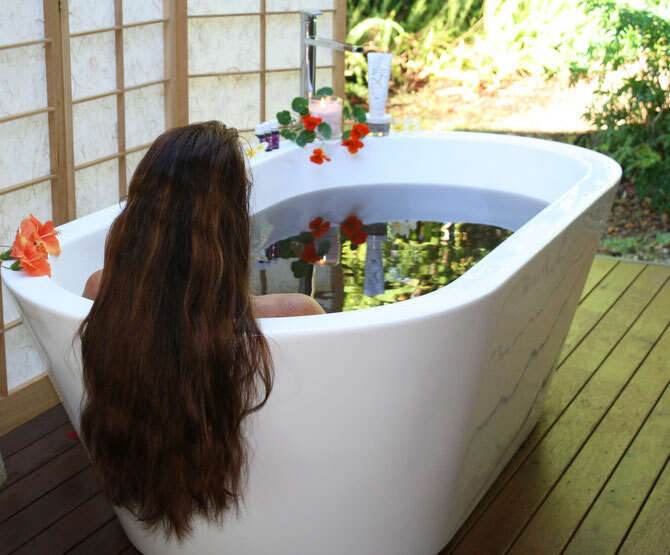 For Bath Therapy do not exceed more than 2 to 3 times a week for three weeks, discontinue for one week, and then resume. Only add therapeutic essential oils to mud bath, bath water may become toxic if you add unnatural ingredients. Due to the muds ability to draw toxic waste, refrain from sharing a bath if you are sick. This may be a health-hazard.